Stock compensation plans sit atop a pretty conspicuous pedestal. Appealing to your team, supremely motivating, but also able to quickly draw the ire and gaze of everyone from regulators and the taxman to external stakeholders, stock comp plans can be a slippery but beneficial slope for organizations when handled correctly. Of course, that’s really the crux of the issue -- how does an enterprise establish and maintain a robust but compliant stock comp plan that makes it worth the time and effort? Well, choosing the right stock comp accounting software is a critical first step that can make it all worth your while. So on that note, Embark wants to share a few thoughts on choosing the right software and what to look for to help you extract the most value and benefit from your stock comp plan. While stock comp plans can have quite a few moving parts and appear complex from a distance, choosing the ideal software for your organization's specific needs doesn’t have to follow suit. Just like any partnership you establish for your enterprise, finding the right software starts with a productive and illuminating conversation with the vendor, an interview that gives you granular insights into what value they bring to the table. Sure, that might sound overly-simplistic, but trust us when we say that this isn’t an instance where you should feel like you need to reinvent the compensation wheel. Be sure to include all of your key stakeholders into the process, your HR department and board compensation committee in particular, as their insights and input are naturally important to factor into your efforts. Remember, you’re looking for a software solution and vendor to make the complexities of your stock comp plan manageable and as convenient but informative as possible. Simply put, the software and vendor are there to make your life easier. Therefore, begin with a thorough understanding of your plan and what solution will best fit your needs. From there, conduct your interviews with potential vendors, placing a particular focus on how they deal with those aforementioned moving parts, including how they would address particular curve balls and scenarios along the way. Present specific hypothetical challenges to the vendors to see how their software handles them and what is required of you. How would I enter a new grant? When a new employee becomes eligible, is the software and vendor a one-stop shop that works with the administrator to register the shares? What happens when someone leaves the company and there are forfeitures? Address these questions along with any other pertinent topics beforehand to make as fully-informed and beneficial a choice as possible. Likewise, ask if they use a manual entry system with a simple, off-the-shelf spreadsheet or proprietary platform software. The only correct answers are those that fit your organization’s plan well. In other words, if you have a large squadron of eligible employees with vesting schedules that look like an upper division calculus exam, specialized software might be better able to handle the size and potentially confusing intricacies of your plan as long as it’s user-friendly. Whatever solution you choose, it should take burdens off of your plate, not add to them. Naturally, even the most intuitive, informative solutions don’t justify burying your head in the stock comp sand. That, our friends, is a recipe for disaster. Your software adds value by lending ease and simplicity to the equation, much of which is based on the plan reporting. It’s your enterprise and people on the line, not your competitor’s, so make certain your chosen software uses clean, concise reporting that provides sufficient, timely information with all the necessary disclosures. Also, since there are no magic bullets to be found, understand what is required of you on an ongoing basis and how much overhead it will consume. Lastly, don’t forget that things can and do go sideways with stock comp plans. When those situations arise, make sure the software vendor has an adequate, knowledgeable, and well-staffed support team to provide help when you need it. When deadlines approach and tension rises, feeling left in the lurch by the vendor is a telltale sign that you made a poor choice. In fact, their support shouldn’t hesitate to roll up their sleeves and walk you through any necessary processes and procedures to help you out of the stock comp darkness. At the risk of sounding like a broken record, their software adds value by simplifying the complex and streamlining your plan for you. If you find at some point you’re not realizing the value you thought you would from the software and vendor, then it’s probably time to break out these sage words from your friends at Embark and start from scratch. We can help you find the perfect fit. Take your time, understand what your plan requires, be deliberate with your interviews, and never hesitate to ask questions along the way. 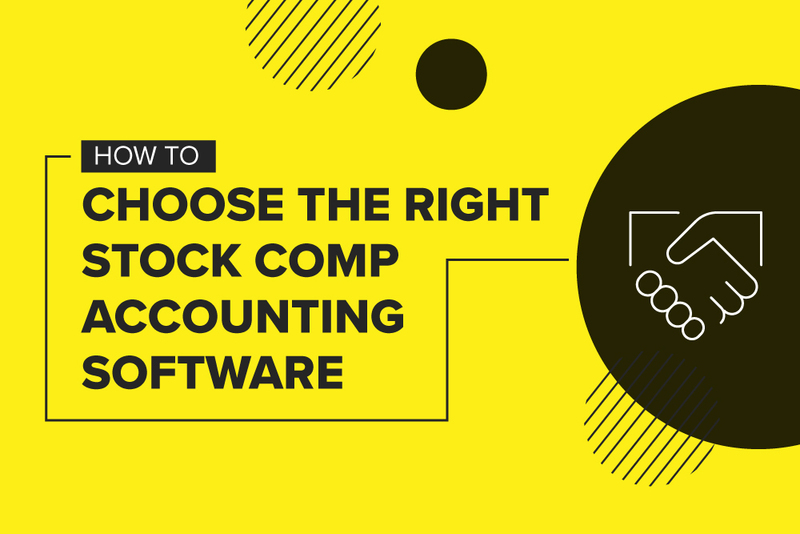 Once you find the ideal stock comp accounting software, your patience and effort will be well-rewarded.